The Depression Prevention program is designed for people who may be experiencing symptoms of depression, to help them improve their mood and sense of well-being, and to prevent symptoms from becoming worse. Depression has significant individual, family, and societal costs. Nineteen million Americans experience depression each year. Depression is a major cause of disability, absenteeism, presenteeism, and productivity loss among working-age adults. By using this two-part, self-administered program program, participants learn how people change, how ready they are to manage their depression, and specific skills which help prepare them to make changes related to adopting five effective strategies to manage depression. Our Depression Prevention Program was recognized in 2012 by SAMSHA and AHRQ Innovation Exchange for its quality of underlying research and readiness for dissemination. It is available in English and Spanish. 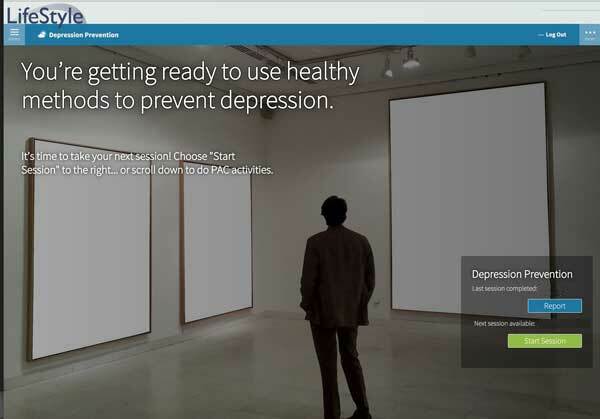 We have self-directed and coaching versions of our online Depression Prevention program. Our clinical effectiveness trial1, of the Depression Prevention program included 902 adults at risk for depression recruited from primary care waiting rooms and by telephone. The treatment group received a stages of change manual and a computer tailored individualized printed report in the mail, and additional individualized reports at one and three months follow-up. Among study participants who were managing their depression, the intervention prevented the onset of depression (12% of treatment participants vs. 20% of control participants experienced a new episode of Major Depression during the follow-up period). Developed with support from Small Business Innovation Research (SBIR) grant R44 MH60522 from the National Institute of Mental Health (NIMH). 1.Levesque, D.A., Van Marter, D.F., Schneider, R.J., Bauer, M.R., Goldberg, D.N., Prochaska, J.O., & Prochaska, J.M. (2011). Randomized trial of a computer-tailored intervention for patients with depression. American Journal of Health Promotion, 26, 77-89.